The Washerst Newel Museum -- in conjunction with the Emmett Lee Dickinson Museum -- will present a very special exhibit on the history of knobs of the world: door knobs, bureau knobs, cane knobs, radio and TV knobs, bedknobs, and many, many more knobs! * The love theme from the movie "Bedknobs and Broomsticks"
* The traditional Irish love song, "Knob, Knob, Knob (I'll Love Ye in the Mornin')"
* The official song for Punxsutawney's celebration of Ground Hog's Day, "The Gobbler's Knob Polka"
* The time-honored ballad "Knobs and Knurls"
* The Knobstick Quartet's jarring arrangement of Emmett Lee Dickinson's now-classic poem about knobs, "The Opening and the Close" -- which contains perhaps the world's most famous melody! 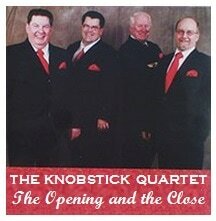 For more information on the Knobstick Quartet, click HERE, and then scroll down to the entry dated August 19. The Knobstick Quartet, a group made up of former prison guards, often performs poetry written by Emmett Lee Dickinson. As a matter of fact, an arrangement of a song based on Dickinson's poem "The Opening and the Close" (below on the left) inspired the group to sing in the first place. Dickinson's poem also inspired his third cousin Emily to pen her poem with the same opening line (below on the right). As Jokes that start "Knock, Knock." Because it does its job. More information about the Washerst Newel Museum if further down this page. Did you know that the very first traffic accident in the United States occurred in Washerst, PA? 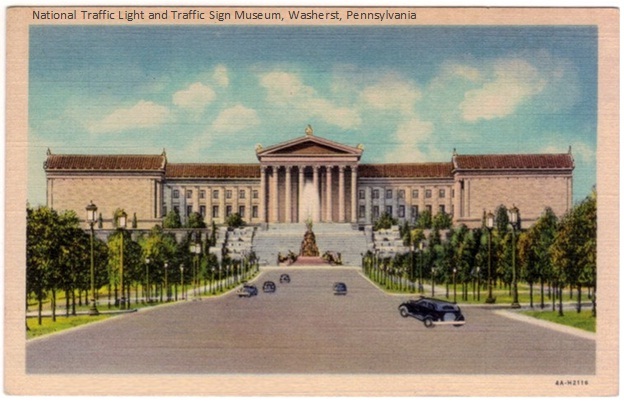 Learn all about the fascinating history of traffic, traffic lights and signs, and traffic laws at the National Traffic Light & Traffic Sign Museum. The NTLTSM special exhibit "The Story of Tunpikes & Tolls" has been extended indefinitely. This interactive exhibit puts highway history in action and is particularly popular with familes and children. Be sure to bring plenty of coins to toss into the collection booths on display throughout the exhibit! 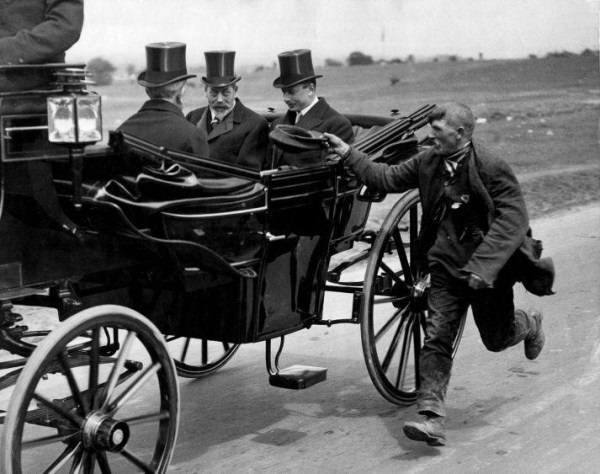 Pictured at the left: Washerst's first toll collector, Ralph Wiedersehen, collecting a toll from a passing carriage. Wiedersehen later invented the toll booth. Pictured at the right: The first toll booth in the world (in historic Washerst, PA), Ralph Wiedersehen's life-changing invention. 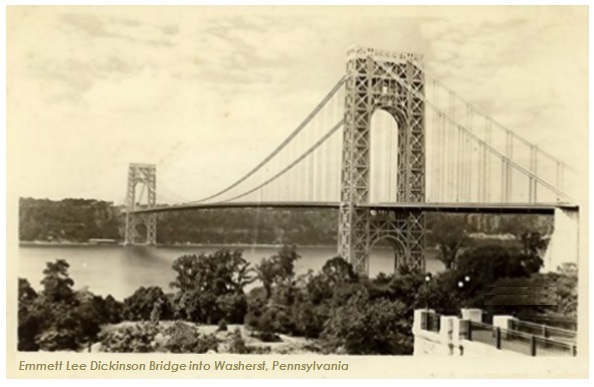 The Washerst Bridge Scandal from the late 1800s will be featured prominently in the National Traffic Light & Traffic Sign Museum's special exhibit "Political Gridlock Ahead." The poem below on the right by Emmett Lee Dickinson (Emily Dickinson's third cousin, twice removed -- at her request), alluded to the scandal -- and it also inspired third cousin Emily to pen her poem shown on the left. 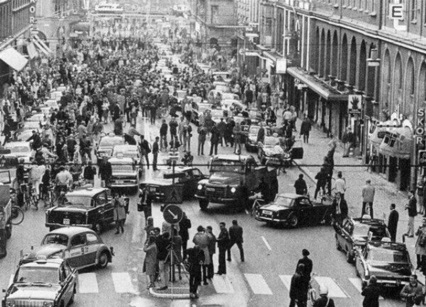 Did you know that the current "Bridge-gate" scandal was not the only traffic/bridge scandal in history? 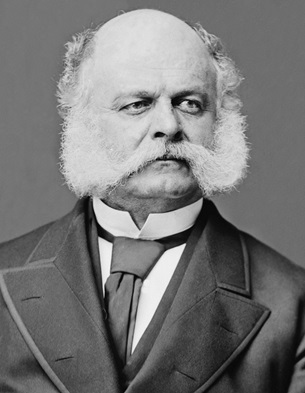 One of the first was in the 1880's when Pennsylvania Governor George Washington Bottleneck's top aide, Carlton Christie (no relation to Gov. Chris Christie), closed lanes on the Washerst Bridge to exact vengeance on Washerst Mayor Alfred P. Mayknott. 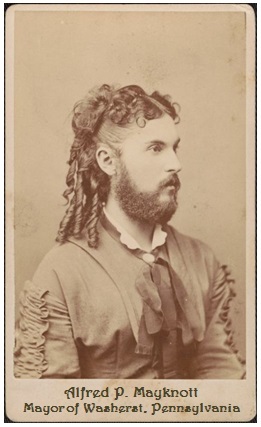 Below: Emmett Lee Dickinson (Emily Dickinson's third cousin, twice removed -- at her request) wrote about the Washerst Bridge Scandal. His poem (on the right) inspired third cousin Emily to pen her poem, "September's Baccalaureate" (on the left). Above left: In 1979, Governor Phil Phillips of New York ran on a promise of "on street parking" during Black Friday sales. 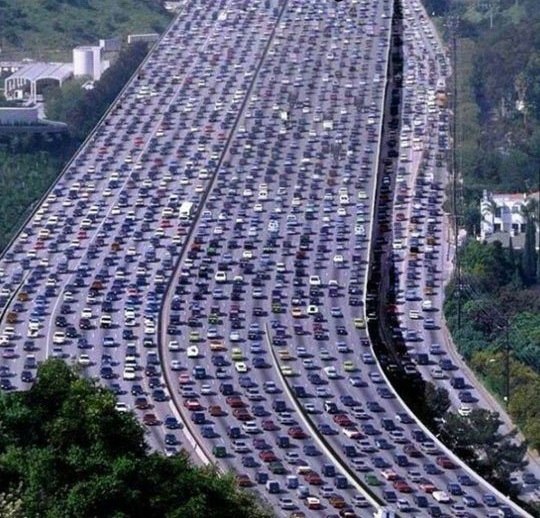 The resulting traffic jam lasted 11 days. Above middle: In 1953, Governor Johnny Johnson of Ohio secretly ordered the change in lane directions in states with a city named "Springfield." 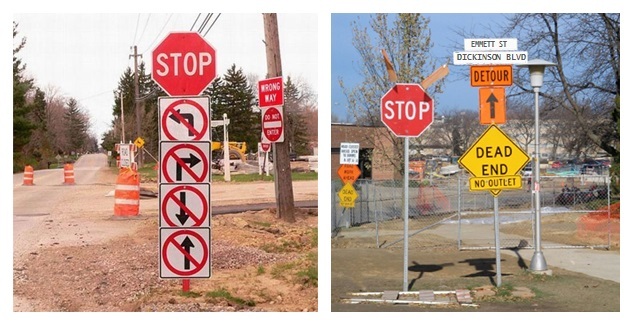 Above right: In 1983, Mayor Michael Michaels of Washerst, PA, ordered a confusing number of signs to be posted in the precincts that did not vote for him in the mayoral election. One of the most popular exhibits at the NTLTSM is "END ROAD WORK: A Retrospective on Highway Protest Signs." 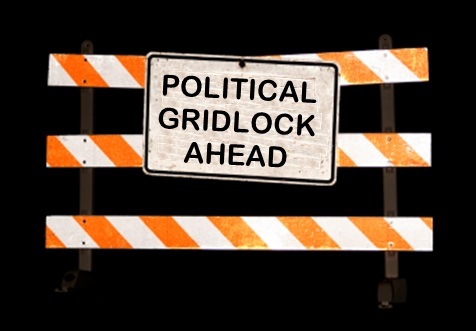 Throughout the history of the United States, road workers and pavers have mounted significant protest movements, but all too often their pleas have gone unheard or ignored. In this exhibit, museum visitors will learn all about their many objections to Department of Transportation policies and practices. Pictured below: Some of the many protest signs on display at the NTLTSM. Another popular exhibit at the NTLTSM is "Potholes: Natures Way of Telling Us to Slow Down." Sometimes called a kettle or a chuckhole, a pothole is where the paving has broken away in the surface of a road, leaving a hole. Learn all of the fascinating facets of potholes at this interesting and entertaining exhibit. While at the NTLTSM, don't miss "Guardrails & Mileposts," an exhibit to spark your imagination and indulge your curiosity in the area of highway safety. Pictured below: A few of the thousands of highway mileposts on display at the NTLTSM. 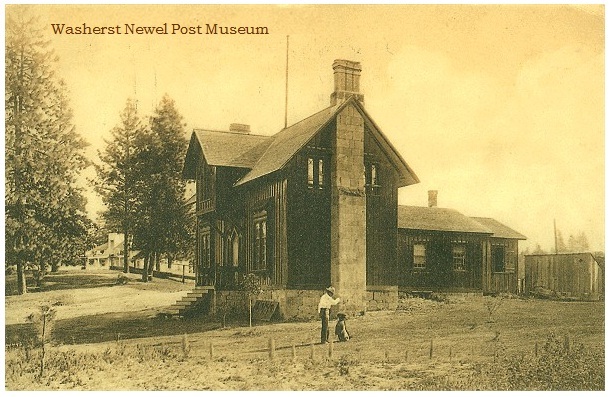 The WNPM is dedicated to engaging, inspiring, entertaining and informing the public on the fascinating history of newel posts. From the wood turning lathe invented by Emmett Lee Dickinson (Emily Dickinson's third cousin, twice removed -- at her request) to the interactive displays with hundreds of newel posts, the museum's collections and hands-on exhibits seem almost endless. From Frank Capra's "It's A Wonderful Life" to the National Lampoon's "Christmas Vacation," finials and newel posts have been front and center in starring roles at the movies. This popular WNPM exhibit documents the history of Hollywood's fascination with newel posts and finials. See how newel posts have changed through the ages -- from the Napoleonic and Victorian Eras to the Machine Age, the Atomic Age, and the Information Age. You'll leave wondering "What's next?" in the world of newels. Have you ever wondered what comprises a "large load" of laundry? Or who determines the settings on an iron for a particular fabric? Or what the best detergent is to use if your male cats spray your living room curtains? 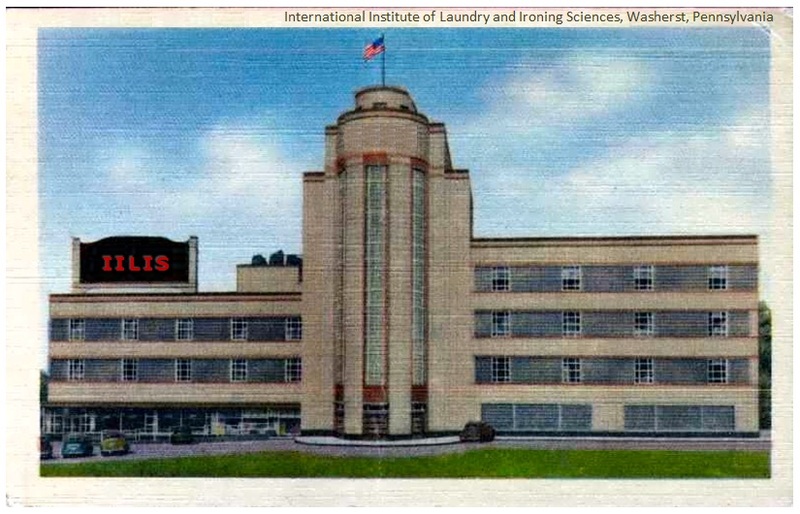 You'll learn the answers to these quesitons and much, much more at the International Institute of Laundry and Ironing Sciences in downtown Washerst. Just look for the building that looks like a washing machine's agitator! 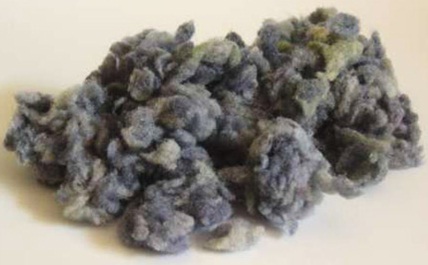 The most popular exhibit at the IILIS, "VENTING Is Healthy For You," includes hundreds of dryer vents on display and lots of hands-on activities for kids! There are also dozens of washers and dryers available for visitors to wash and dry clothes to collect lint for the world's largest lint ball on display in the Institute's atrium lobby.